Speakers from labor and academia attempted to answer the question “Was the strike worth it?” placing it in the larger historical and political context. Daily News columnist Juan Gonzalez underscored that point, describing the transit workers’ anger at the racist arrogance of the Metropolitan Transit Authority bosses and their indifference to the extremely difficult, even dangerous, working conditions. Roger Toussaint, president of TWU Local 100, described in detail the challenges facing the union in the period leading up to the strike and why it ended the strike when it did. The union is still struggling for a contract after a first post-strike vote that rejected the contract by seven votes, and then a revote, held in March, where the same offer passed overwhelmingly. Many speakers addressed the importance of the union’s fight against a two-tier benefits system. Saskia Sassen from the University of Chicago spoke about the chipping away at working people’s rights that has taken place in the last quarter century, while the rich and powerful have gained rights. “This strike made history, because it allows many more than just the striking workers to claim rights,” she said. The strike made “economic and strategic history,” given the importance of New York City in a globalized world. Many speakers also talked about the impact of the strike on the NYC labor movement. 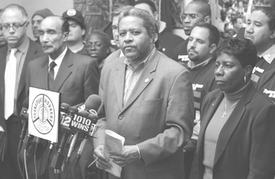 Freeman pointed to the “more combative stance of labor” that has already begun, citing United Federation of Teacher President Randi Weingarten, who said that her union would apply the same principle of “no contract, no work.” The strike also added to pressure to repeal the New York State’s Taylor Law, which makes strikes by public workers illegal.